In this paper, we introduce a formal model of the availability, budget compliance and sustainability of istributed services, where service sustainability is a new concept which arises as the composition of service availability and budget compliance. The model formalizes a distributed platform for monitoring the above service characteristics in terms of a parallel composition of task automata, where dynamically generated tasks model asynchronous events with deadlines. 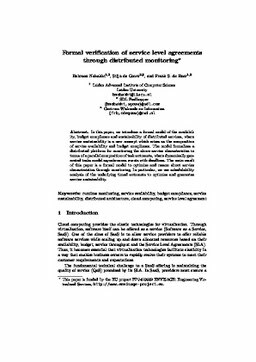 The main result of this paper is a formal model to optimize and reason about service characteristics through monitoring. In particular, we use schedulability analysis of the underlying timed automata to optimize and guarantee service sustainability.